Camp Northern Lights takes you away from your normal routine. We offer a north woods escape, where you can surround yourselves in serene wilderness, take a break from life’s many interruptions and relax together as a family. Come for a week or long weekend in the summer and schedule outdoor activities from hiking and boating to cookouts and talent shows. If you're looking for a retreat in the fall, winter or spring, select from our many lodgings and enjoy your own getaway in the northern woods. 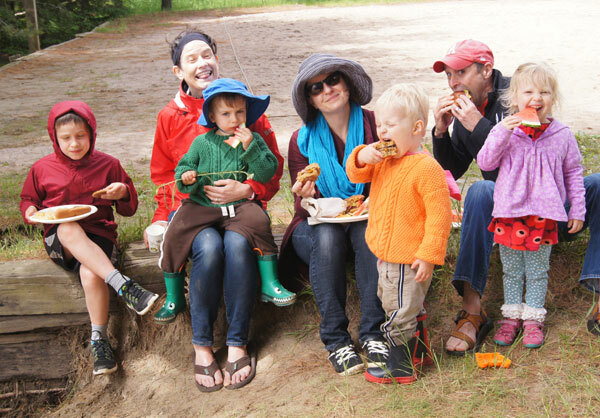 We offer everything from family-friendly campsites with tent rentals to full-facility cabins. Families come in all shapes and sizes. The definition of “family” can be different for many people. At Northern Lights, we appreciate the value of diverse populations and welcome all. Camp brings together families of all kinds, strengthening relationships and creating unforgettable memories that you’ll share for a lifetime. Our 3 day, 4 day and full week family programs offer staff-led age-specific programming for a portion of the day and all-family programs in the afternoons and evenings. Create long-lasting memories with a fun-filled weekend in the north woods. We have activities for all ages, including guided hikes and paddles, arts and crafts, family saunas, campfires, skiing and snowshoeing. Enjoy a fun and relaxing getaway in nature. Choose to enjoy activities like hikes and fishing, arts, saunas, campfires and sports—at your leisure.